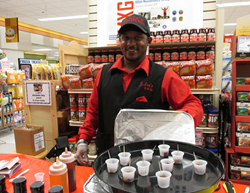 Residents and visitors alike in South Carolina commissaries get a taste of the sauce that's sweeping the Nation. The Sauce Team (TST) introduced South Carolina military bases to J. Lee’s Gourmet BBQ Sauce in early November and continued the streak of record sales every where the product is presented. J. Lee's showed once again why it is known as "A Taste That All Families Love", and why customers are encouraged to, “Put It on Anything”. Several customers echoed “I have to have it” and "It’s the best sauce…, I can’t wait to try it on my pulled pork, my chicken, my ribs, baked beans...", and so on. TST presented J. Lee’s to commissary patrons on five installations and sold 590 bottles in 27 combined hours. The customers swarmed around the sampling with curiosity until they tasted the sauce and then proceeded to discuss the product and often times attempted to promote the sauce to their friends and even passersby. TST visited Fort Jackson, South Carolina commissary first on the trip, and store Director Mr. Bernard Ellison, a retired U. S. Army Sergeant Major, welcomed the Veteran based company with open arms. Mr. Ellison located the team’s demonstration table in the store’s most prominent location, near the main entrance. Approximately 95 percent of the customers entering the store tasted the sauce and about every second or third person purchased one or more bottles. Three hours later every bottle in the store (214) were sold, and the customers that followed, heard about it through the many customers still in the store raving over the taste, texture and aroma of J. Lee’s. The Carolina’s, North and South, are known for its unique brand of barbecue; specializing in vinegar and or mustard based sauces. J. Lee’s Gourmet BBQ Sauce's sweet taste, followed by a slight tang, and then an even slighter kick, sways taste buds everywhere the team takes it, said a TST spokesperson. He followed that by stating, “One taste is all it takes”. For more information on J. Lee's Gourmet BBQ Sauce, or to order bottles, visit the company's website at http://www.jleessauce.com.